HOUSTON — A Baytown couple is suing a construction company, alleging that water was negligently diverted onto their property and caused immense damages. Heather Gantt and Daniel Gantt filed a complaint March 26 in Harris County District Court against SER Construction Partners LLC, Longhorn Excavators Inc., and Kilgore Park LLC, alleging violation of the Texas Water Code Section, gross negligence, negligence, nuisance and trespass. According to the complaint the Gantt property at 1538 Sterling Drive, Baytown, was damaged Dec. 8, 2018, when the defendants unlawfully diverted water onto the plaintiffs’ property during rainfall. The suit says the water caused Baytown property to flood and the Gantts to be displaced. The plaintiffs allege the defendants were negligent in failing to obtain the proper grading, drainage plans and permits. The Gantts seek economic damages between $200,000 and $ 1 million, punitive and exemplary damages, attorney fees and costs related to the case as well as all other just relief. They are represented by attorneys Alejandro L. Padua and Sara E. Padua of Padua Law Firm PLLC in Houston. If your home or business property was flooded (or the flooding levels and duration was significantly increased) due to the flood water releases from the Addicks and Barker reservoirs or the Lake Conroe Dam, you may be entitled to financial compensation from the responsible and appropriate governmental body. 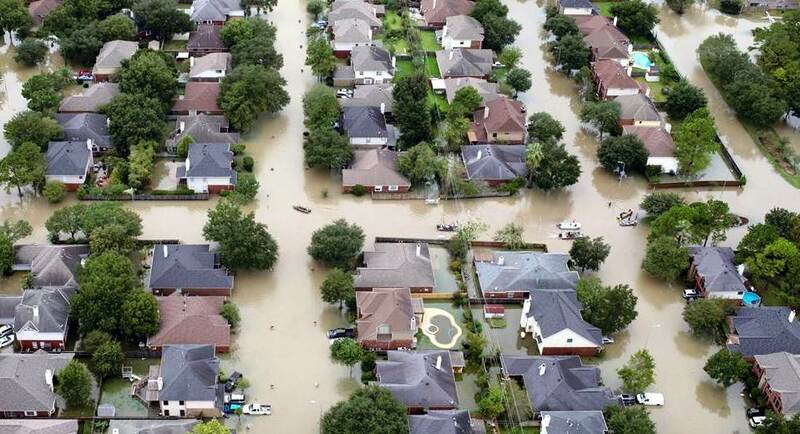 Such financial compensation can be obtained through claims of “inverse condemnation” against such governmental bodies including: the Federal Government, Harris County Flood Control District, the City of Houston, and the San Jacinto River Valley Authority, among others. For Many Flooded Property Owners, Your Only Option May be to Pursue an Inverse Condemnation Claim. We offer Free Case Consultations and Contingency Fee (No Fees Unless You Recover) Legal Representation. Call us at (713) 840-1411. The 5th Amendment of the United States Constitution and Article I, Section 17 of the Texas Constitution protect property owners from damages or “takings” of their property by requiring just compensation for their losses. Typically, the government or other private companies with eminent domain authority (such as utility or pipeline companies) take direct action to acquire property from private owners by negotiating a purchase or initiating the eminent domain proceedings whereby the fair value of the property being taken is agreed upon or decided through formal or informal proceedings, and such value is paid to the property owners. In an “Inverse Condemnation,” the condemning authorities first “take” or damage property without compensating property owners. A property owner in this situation is then forced to file an “inverse condemnation” lawsuit against the government or other condemning entity. This is usually done through an experienced inverse condemnation attorney. 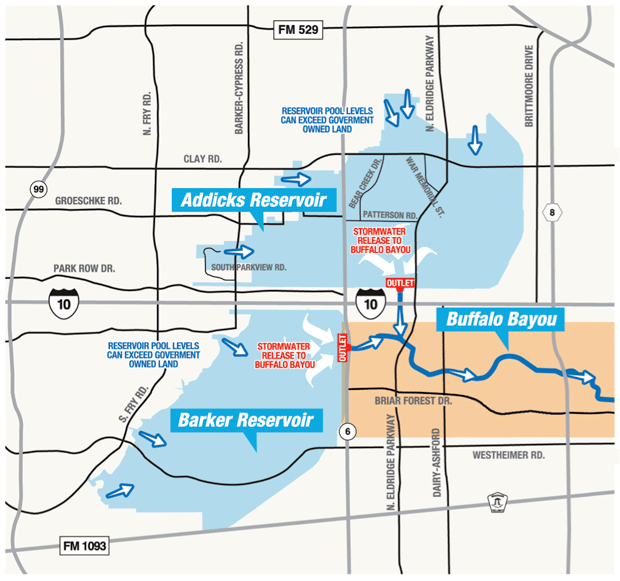 If your home or investment property is located downstream of the Addicks and Barker reservoirs along the applicable portions of Buffalo Bayou, AND sustained flood damage commencing on or after Monday August 28th, (or the flooding significantly increased on or after such date) then you may be eligible for compensation. If your property is located upstream of the Addicks and Barker reservoirs, AND sustained flood damage from Hurricane Harvey, then you may be eligible for compensation. If your home or investment property is located downstream of the Lake Conroe Dam along the applicable portions of the San Jacinto River, AND sustained flood damage commencing after the deliberate and intentional release of water from Lake Conroe (or the flooding significantly increased after such release) by the San Jacinto River Valley Authority, then you may be eligible for compensation. I Heard About a Class Action Lawsuit Filed. Should I Join An Inverse Condemnation Class Action Lawsuit? We believe that each potential claim of each individual client whose property has been damaged is unique and requires an independent legal analysis to properly answer this question. While it is true that many law firms in the Houston area have filed class action lawsuits in both State and Federal Courts, you are under no obligation and absolutely no rush to join a class action lawsuit. Furthermore, depending on the facts of your particular case, the proposed class action lawsuit, and the jurisdiction each was filed in, your case may be better litigated individually. In other words, you get your own lawsuit. CONTACT AN INVERSE CONDEMNATION LAW FIRM – WE ARE AVAILABLE TO PROVIDE MORE INFORMATION AND REVIEW YOUR CASE — CALL 713-840-1411 OR EMAIL US. In short, the best course of action, is to contact an experienced inverse condemnation lawyer that will take a personalized and thorough legal analysis of your case. We are available to provide more information regarding these matters and collaborate with various well-respected property and engineering experts as well as other law firms throughout the Houston area. If you are not dealing with an emergency situation, return to your property safely. Once you are there to assess the property damage, if there is still flood water present, ensure that you shut off the electricity and gas at your property. Move your possessions away from the water to mitigate further damage to your personal property. It is important to keep track of all damage to your property. You may want to separate the damaged property from the undamaged property. Click here for a sample form that you can use to keep an organized list of all your damaged personal property. Take photographs of the water levels and any damage to your property as soon as possible. Photos help your insurance adjuster determine how much you should be compensated for the property damage and can later help in court if litigation is necessary. Pictures of your home or commercial property before the property damage can sometimes offer a “compare and contrast” to show the true extent of the property damage caused by the hurricane or storm. Make sure you take photographs of all types of property damage, including discarded objects, structural damage, and standing floodwater levels. If you can, take videos of the property damage as well. Promptly tell your flood insurance company you’ve suffered property damage due to the flooding. Cooperate with them and tell them the extent of your losses and property damage. Be sure that you do not confuse your flood insurance carrier, with other types of property insurance that you may have. Notify all of the appropriate insurance carriers. Before you call your insurance, ensure you have the name of your insurance company, your policy number, and a telephone and/or email address where you can be reached at all times. Write down the claim number that the insurance representative gives you, and keep it handy when communicating with your insurance company. Once you talk to your insurance it is a good idea to send them any photos or videos of the property damage. You also want to make sure you memorialize your communications with your insurance company, including the date and time of any calls, emails or texts, who you communicated with, and the details that you communicated about the property damage. If possible, provide notice in writing to document that the notice obligation has been satisfied. Policies usually provide for a short notification period after the covered property damage event. After you have thoroughly documented all your damage, and notified your flood insurance company, begin steps to prevent any further damage to your property. Using high water boots, gloves, and other protective equipment, take all affected large items such as rugs, furniture, bedding, and carpet outside to dry. Do not discard these items until you have thoroughly documented their damage and spoken to your insurance adjuster. Remove any natural debris, and, and dirt or mud out of the house. Remove Sheetrock and other water-absorbing construction materials to a few inches past the flood level. Cover the affected parts of your roof with tarp or some other moisture barrier material. If you do not think you can get this done yourself, you may need to obtain the help of family, friends, or neighbors or you may hire qualified contractors to help you. Typically, your flood insurance policy will require you to file a “Proof of Loss” in connection with your property damage. A proof of loss summarizes the amount and extent of the property damage or loss. You must generally submit this signed and sworn Proof of Loss within 60 days after the flooding trigger event. Because when a person suffers a catastrophic or otherwise major loss, it often takes significantly longer than 60 days to assess and document the full extent of the property damage. In such circumstances, you can try to obtain an extension to this deadline in writing or sometimes the appropriate government agencies may grant extensions to that deadline. An insurance company adjuster will visit your home or business property to inspect the flood damage to your property. Provide them with any information they need regarding the extent of your property damage and make them aware that there may be additional property damage that you have not yet uncovered. At this inspection by the adjuster, make sure that you point out all of the property damage that you know of at the time. If you aren’t satisfied with how your insurance company has valued your property damage, don’t give up. In some cases, it may be beneficial for you to engage one or more contractors that you trust to provide estimates on the repair and/or replacement cost of your property to compare with the amount your insurance adjuster has provided. Assertively inform the adjuster of your concerns. If you can’t agree on the value of the property damage, consider engaging an experienced flood damage attorney. An attorney can help you if an insurance company seeks to delay, deny, or unfairly value your property damage claim. Contact for a free, no obligation consultation related to your flood damage. Phone 713-840-1411. Padua Law Firm represented Texas Senior Housing Operator, LLC in raising and closing $29,907,557 of capital for the development, construction, and operation of senior housing community in Montgomery County, TX. The senior living community, Woodhaven Village, consists of 157 independent living, assisted living, and memory care homes and is located on approximately 11 acres in Conroe, TX adjacent from the upcoming Grand Central Park. 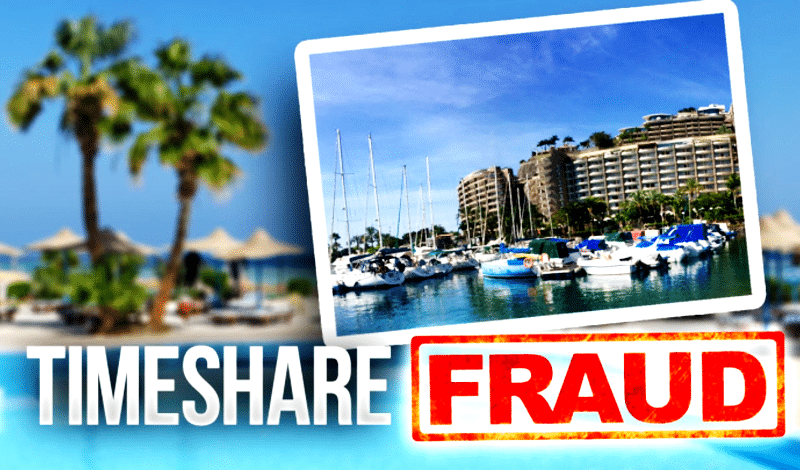 The capital raised consisted of a combination of both Equity and Debt and was primarily obtained from Texas Senior Housing Operator, LLC financial partner, Lancaster Pollard, together with its preferred lending institutions as well as individual accredited investors. The general contractor performing the construction of the improvements at Woodhaven Village, is FCI Multi-Family Construction, who is a longtime partner of the principals of Texas Senior Housing Operator, LLC. The management and operator of the facility is Paradigm Senior Living.